China Project - HISTORY'S HISTORIESYou are history. We are the future. “The longest journey begins with a single step." Get out your passports and pack your bags! You’ve been selected to take part in ​The Amazing Race: Silk Road Edition. For this project, you will join a caravan of classmates to travel and trade along the Silk Road. During your travels, you will meet the peoples and explore the places of ancient China, Central Asia, the Middle East, and the Mediterranean. Led by clues earned upon completion of each leg of your journey, you and the other members of your caravan will share adventures and encounter challenges. In this Amazing Race, the way you work together will greatly determine your success. Will your caravan skirt catastrophe and accumulate wealth, embracing the opportunities and ideas that were the lifeblood of the Silk Road? Or, will you succumb to the dangers that reside in the reaches of the long days and longer nights, along every twist and every turn of that ancient trade route, the Silk Road? This is a research project and the work is collaborative. Classmates will be your caravan companions and project partners. Because collaborative work is often difficult work, before you begin your long journey you will take part in a classroom lesson in which you will practice group decision-making skills. Together as a group, you will create a Google Earth trip tracing your caravan’s progress along the Route. As you journey through time and travel along the Silk Road, I want you to create a record of your trip that details both the triumphs and the trials of your tour. While on your trip, I want you to dig deeply and use your research skills and your imagination to record what it was like to live and work along-side of the ancient peoples of the Silk Road. For a successful project, you will record their story along with your own. On your trip, you’ll have the opportunity to visit the small oasis towns of the Taklamakan Desert, stopping points that were essential to the Silk Road and to the success of all traders who journeyed along the overland route. Likewise, you’ll have the opportunity to spend time in the bustling cities, places made both busy and wealthy by their connection to Silk Road trade. To make the journey over land, you may brave the deserts, plains, and mountains, as well as the extremes of weather, astride a camel. If riding atop a camel makes you queasy, you may instead choose to travel by foot. In either case, you will be traveling as part of a caravan. With the constant threat of thieves a part of daily life on the Silk Road, to do otherwise would be foolish. If, on the other hand, you explore one of the ports along the Maritime Silk Route, you may travel aboard one of the many ocean-going dhows that plied the waters making stops along the Asian, Indian, and Arabian coasts. Goal: This project has several challenges. Those challenges include using technology to be creative and to collaborate with one another. During this project, each group member will be called upon to fill several roles. You will all plan and budget your trip, research and write, find pictures, try your hand at technology-design, and support each other as caring partners and editors. Because your work is shared and on-line, you can access your work and the work of your partners from any computer at any time. One of the great things about using Google Maps/ Google Earth to record your travels along the Silk Road is that others get to make the journey with you. In order to make the record of your trip more enjoyable for those who choose to follow you in the “virtual world,” a key challenge for this project is to make your virtual caravan companions believe that the record of your journey reflects “real” experiences along the Silk Road. To do that, you will need to blend the best of your caravan’s research and its creativity. People who inhabited the Silk Road – traders, nomads, diplomats, religious figures, princesses, poets, soldiers, and bandits. On the pages of this blog, you will see more information about each of the research topics listed above. You will also find links to information about each topic. Your challenge is to blend your research into a believable story for each of your Google Maps placemarks. To do that, your aim should be for historical accuracy, even while you create this fictional record of your travels through time. 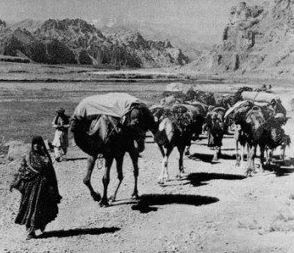 The name Silk Road conjures up images of caravans trudging through some of the world’s highest mountains and most god-forsaken deserts. Certainly, that was true for parts of the route but that only tells part of the Silk Road’s story. The Silk Road was not one well-established road. Instead, it was a complex, constantly-changing network of land and sea routes between China, Central Asia, the Middle East, and the Mediterranean that was in operation roughly from the 1st century BCE to the 15th century AD. The main sea route went from Guangzhou, China via the South China Sea and the Indian Ocean to Basra on the Persian Gulf or Suez on the Red Sea, where the goods were then carried overland across Persia and Syria or through Egypt to ports served by European merchants. The main overland Silk Road route went from Chang ‘an in eastern China via Kashgar in Western China, Samarkand in Central Asia, and Baghdad in the Middle East to coastal cities on the Black Sea and the eastern Mediterranean, cities such as Alexandria, Tyre, Antioch, and Constantinople. Travelers could feed their animals off the land and find food and drink along the way. In the early stages, goods were often traded through barter. It was only much later that money was used. Silk Road routes were often disrupted and were changed frequently due to the presence of bandits, political alliances, droughts, storms, seasonal changes, wars, plagues, horsemen raids, and natural disasters. 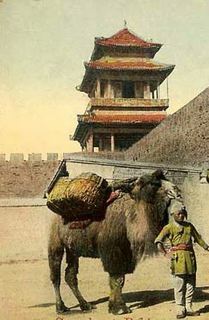 Many Silk Road towns and caravanseries were located within fortresses for protection from bandits and marauding horsemen. Many also had security forces.